This tea is possible one of the most delicious green teas I have ever tasted! It's light and sweet, and doesn't need any sugar or honey to make it taste good! It's a perfect blend of the earthy taste of traditional Japanese green tea and the sweet zingy kick from little bits of citrus fruit. 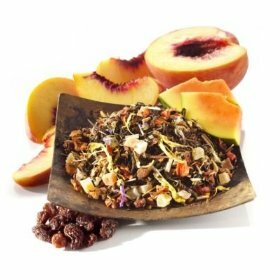 Many of my friends claimed they just hated fruity teas until they tried this. They changed their tune as soon as they sipped this tea. I'm not brewing 2-3 cups of this a day for me and my mother, who is sick. I kept encouraging her to drink tea, and this is the only one she really likes. The vitamins and minerals have done wonders for her health, and have helped jump start her immune system. I've lost weight, since I started drinking this instead of soda, and I have yet to catch my exam week flu, either. It's all thanks to drinking really good quality, well brewed tea. It's actually a great price, just two ounces makes around 30 to 40 cups, and can then be re-steeped a couple times. Just compare it to the prices of bagged teas you see in the store. You're probably paying around 4 dollars an ounce, since a box of tea usually costs between 2.00 and 2.50 and contains about an ounce of tea. Since bags can't be reused, buying loose leaf tea in bulk is a good deal. The tea leaves are also top quality, and unlike a lot of other teas, the fruit isn't just flavoring, it's real chunks of dehydrated fruit you can see in the mix! This tea is a must-try for any tea lover, or someone just wanting to experience the benefits of green tea.